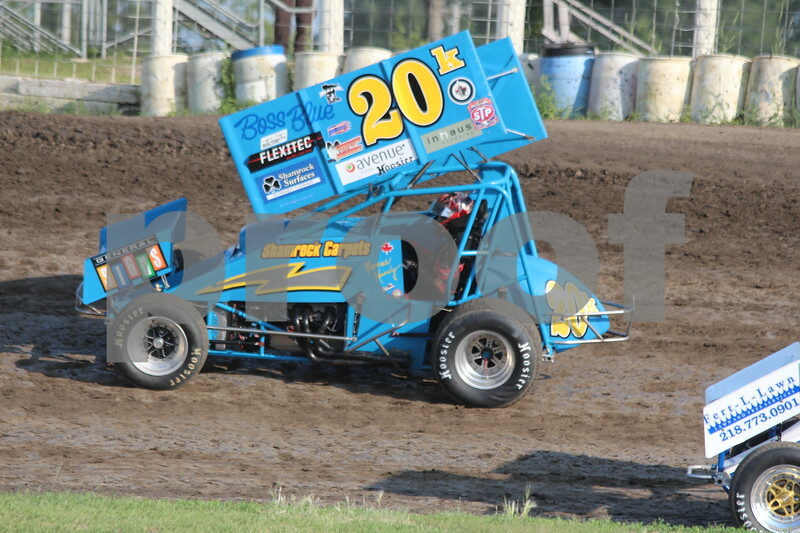 Glyndon MN July 28 2013: Thomas Kennedy claimed a coveted feature win in front of a full field of sprint cars, including the UNOH All Star Circuit of Champions group, at Buffalo River Race Park in Glyndon, MN on Sunday. The crowd on hand was thrilled to see a local NOSA driver take the win. Cory Mack, another NOSA sprint, also led laps and had a respectable 4th place finish. Kennedy was pleased to see that although track conditions rubbered down, there was more than one lane to pass, “it was rubbered down, top to bottom, which made it a lot easier to pass cars on the outside.” Kennedy considered the top 8 starters to be his biggest challengers in the race. He also noted that with the size of the track, lap traffic was an issue to contend with. Kennedy notes that part of his success is due to achieving a good balance in his cars setup this year, “we haven't really been changing a whole lot from race to race.” For Sunday’s race, Kennedy altered the stagger he ran for his heat race prior to the feature. The team also chose to use a medium RR for qualifying and the A main and then an H15RR for the heat race. Kennedy stated that Sunday nights’ win has been “my biggest accomplishment thus far.” However, Kennedy can also boast a win against World of Outlaws’ Donny Schatz in a June NOSA race at Nodak Speedway in Minot, ND. Due in part to his success with the All Stars, Kennedy has decided to race in this weekend’s Knoxville 360 Nationals and has also entered the 410 Nationals. Kennedy also recognizes that his success is attributable to his grandparents, parents and brothers who help support his race team. He also thanked sponsors: KennedyFloorings, General Signs, Team Boss Blue, Shamrock Carpets and Forks Finest Auto Body Car Wash. Kennedy also praised the upgrades that have been made to the Buffalo River Race Park (BRRP) facility, a sentiment echoed by many NOSA drivers and fans this year. The NOSA Outlaw Sprints will be featured this Friday at River Cities Speedway in Grand Forks, ND. NOSA will be racing two A main features in order to make up a rain date from mid June.